Hello all, I have research experience working as a Bioinformatics programmer/analyst for close to 3 years post my Masters in Bioinformatics from USA. I have experience working with Next Gen Sequencing data sets from different platforms and technologies. IMHO this is not something that is easy to discuss. There are so few openings and typically each position that a student may find themselves in is so different that discussing these as a whole is not productive. I agree with your opinion. I just wanted to get an overview of these programs/other programs. I'll look in to the research interests of faculty at respective institutes and network more. Thanks! Precisely what do you want to study? What will you achieve by obtaining a doctorate that you couldn't achieve by studying on your own or in your career? Is there an investigator at [x] institution whose focus aligns with one or more of your interests? Too many people have to slog their way through a PhD, studying something that doesn't truly light a fire. That's not how it should be. 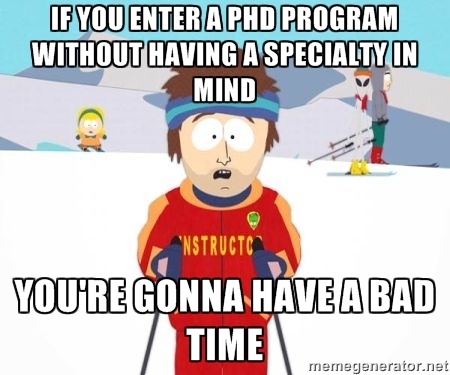 A PhD defines you in a way that other degrees do not. A PhD is a certification that you are profoundly skilled and knowledgeable in a particular concept within a field. It will be expected, from anyone you encounter in a professional context, that you are dedicating your life to furthering the world's knowledge in that concept. This is a bigger commitment than buying a house. It's almost a bigger commitment than marriage. You're investing three or more years of your youth and defining yourself in the process. It's a much more sophisticated version of a face tattoo, in that people are going to make lots of assumptions about you based on your doctorate and field; they'll have to get to know you well before they get past those assumptions. Know precisely what you want to study. Look at investigators, then institutions. Reach out to those investigators. If you're truly passionate about studying something, have professional experience, and there exists funding to accommodate you, most investigators will happily take you in, and this will be to your benefit during the application process. Will professional experience be considered without having paper publication(s) ? Thank you for your thoughtful comments and suggestions.